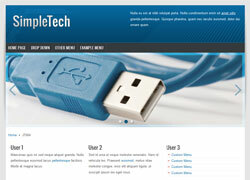 Technical theme for Joomla. Web template with drop down menu and slider for technical company website. Open source free download Joomla template for computer company website or technical themed web site design and layout.